This pair are out in a league of their own when it comes to fly tying manuals and Emergers is so authoritative that I seriously doubt if anything better is likely to be published in our lifetimes. Not only have the authors exhaustively researched the subject, the photography is fantastic and the reproduction faultless – we reviewed the spiral bound hardback, which can be laid flat on a table, but for about a third less, there is also a paperback. If you are still trying to visualize just how nice Emergers is, think of The Fly Tier’s Benchside Reference, divide it by about three and then fill it to the brim with beautifully photographed patterns, with each tying stage clearly illustrated. 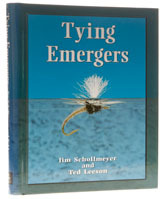 If there is an emerger pattern that is worth trying, it is in here, if you are inclined to experiment, there is plenty to inspire you, and if you are curious to see how to do a perfect fly tying manual, then look no further.